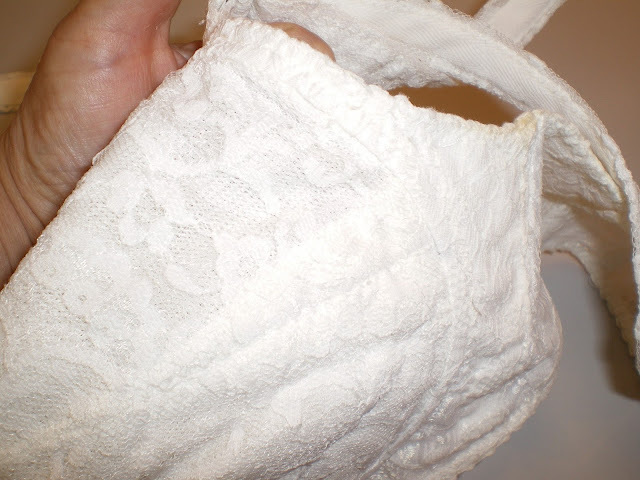 Recently a student brought in a white vintage bra, so we’ll take a bit of a breask from the blog posts on Behind the Seams of the Craftsy bras. It is very enlightening to see how far we’ve come in bra-making, so I appreciate seeing these vintage bras close up! I love seeing how the construction was handled on this white vintage bra. Sometimes I will clone the bra to see the design and how the parts are shaped. Once upon a time, back in the 1960s there was no foam for bra cups. Can you imagine such a thing? So what did they (by that I mean “we”) use back then? 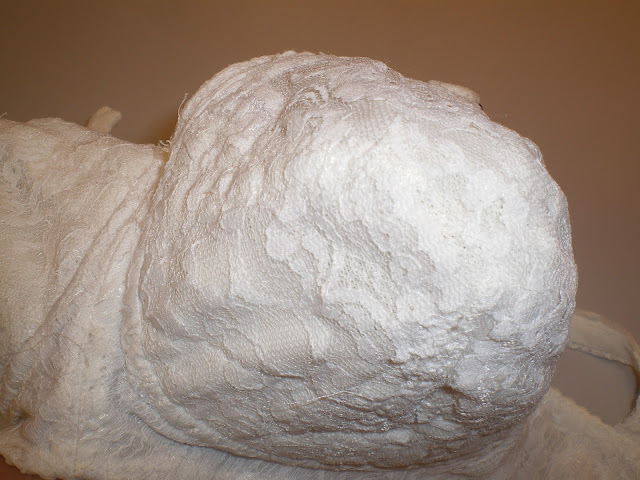 We used fiberfill, cousin to quilt batts and upholstery wadding! Dacron was the fibre of choice which, as I recall, had an itch factor in a class of its own. Here’s a close up of the cups. That lace is rigid, so nothing is going to move! But in spite of the pointed cups, the cups look round in this photo. I assure you, that bra had bullet shaped cups! This was the typical strap attachment with a short strap fastening to the upper cup and a slide-lock for the adjustable straps. You actually put the long ends of the straps inside the bra at the front! Here’s a better picture of the slide lock. We sell this one for those who want the adjusters up front or want the authentic vintage look. 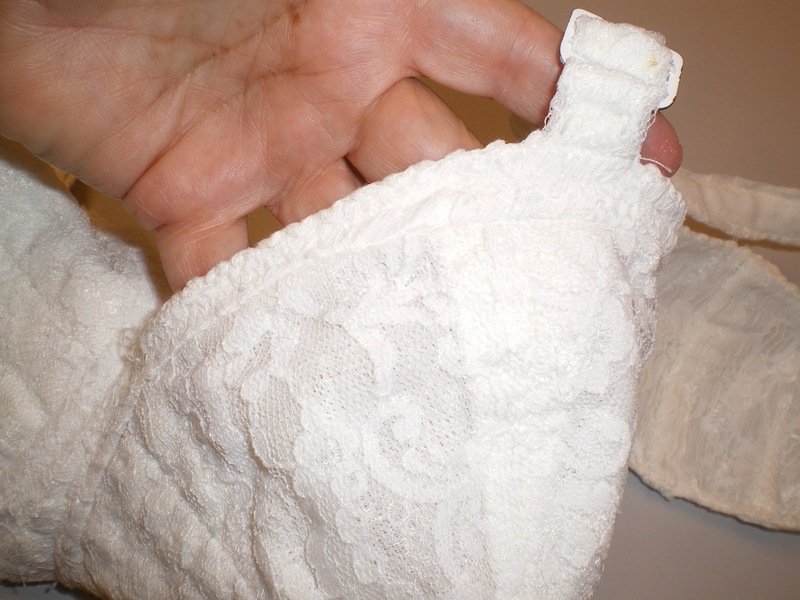 As in most of the bras of the day, this one has a seam running across the bust point, but also a vertical seam, dividing the breast into 4 parts. You can barely see the cross cup seam here. The back band had been altered with a dart in the left side of the photo. Interesting to note, that even then, we had to made adjustments in ready-to-wear for our own unique bodies. 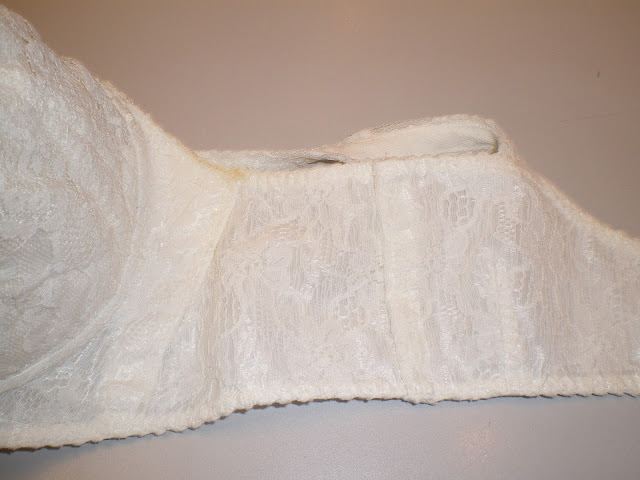 Notice too, that the back band has no stretch – that rigid lace goes all the way to the back hook and eye. Remember, spandex was still 10 years in the future! 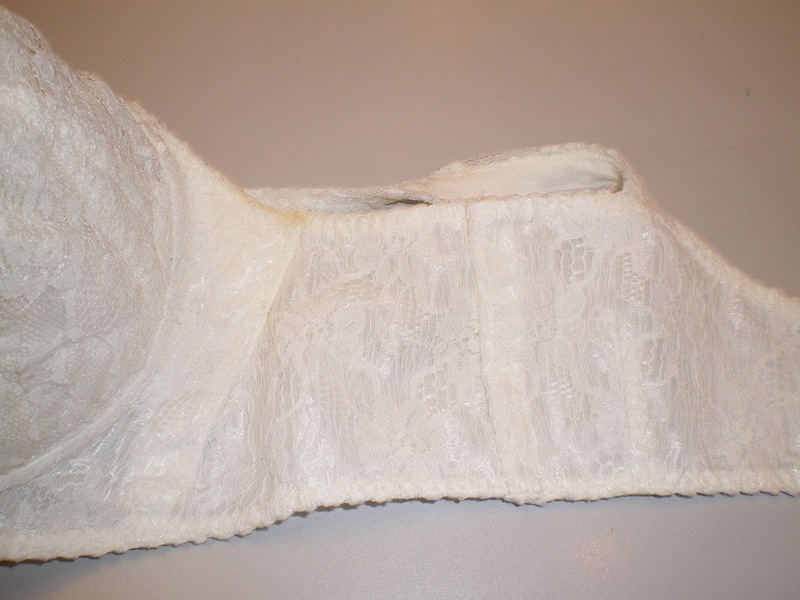 You can also see the twill tape sewn behind the straps of the white vintage bra. This is one rugged bra! Have you a vintage bra in your collection? Does anyone except me collect vintage bras? If so, I would love to have photos of it inside and out to feature on this blog for others to enjoy! I remember my first bra, a cut down of my Mom's worn out circular stitched pointed bra. Because I had "hidden" my growing shape under really tight undershirts, she had no idea that instead of her "A" cup which she figured would be more than ample, I was a major "C" cup. Most embarrassing trip to the JC Penny to get a bra–that's right she figured I would grow more and didn't want to waste good money on something I wouldn't wear enough to totally wear out. When I earned and saved enough money to purchase my own semi better fitting bras, the first thing I did was to round that #**# point. Totally love making my own well fitting, beautiful bras thanks to your Craftsy Classes.